(New Britain, Conn., Apr. 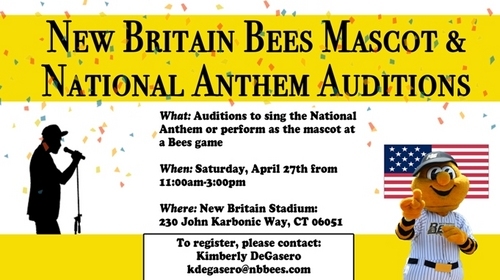 3, 2019) – The New Britain Bees are looking for National Anthem singers and mascot performers for the 2019 season. National Anthem and Mascot auditions will take place at New Britain Stadium on Saturday, April 27 from 11:00 am to 3:00 pm. Those interested in auditioning to sing the National Anthem or perform as the mascot may email kdegasero@nbbees.com to register. Please include which performance you would like to audition for and a preferred time you would like to perform. We will schedule you as close to your preferred time as possible as we will be placing everyone in set time blocks starting at 11:00 am and ending at 3:00 pm. During the National Anthem audition, contestants will have the opportunity to sing once in front of a panel of judges. Performances will be held with a strict two-minute time limit. Soloists, groups, and instrumentalists are all invited to audition. Some of the areas of focus for the judges will be lyrical accuracy, voice quality, presentation, voice projection, time, and overall performance and talent. Ideal mascot performers should have prior experience performing as a mascot, but it is not required. During the audition, candidates will be provided with a script and asked to simulate game situations. Know the perfect participant? Want to see a friend or family member perform on-field at the ballpark this year? Forward them this information and encourage them to sign up. Fans are also invited to watch these performances and support their friends and family as they audition. For more information, please contact the Bees Community Relations department by calling (860) 826-2337 or by emailing kdegasero@nbbees.com.